Gov. Phil Bryant, right, and author Eudora Welty niece Mary Alice Welty White, second from right, admire the inaugural Mississippi Writers Trail marker honoring Welty in Jackson, Miss., Monday, Sept. 10, 2018. The celebrated writer was the winner of the Pulitzer Prize, The Presidential Medal of Freedom and the French Legion of Honor. Welty typically drew upon her native state for the settings of her fiction and photography. 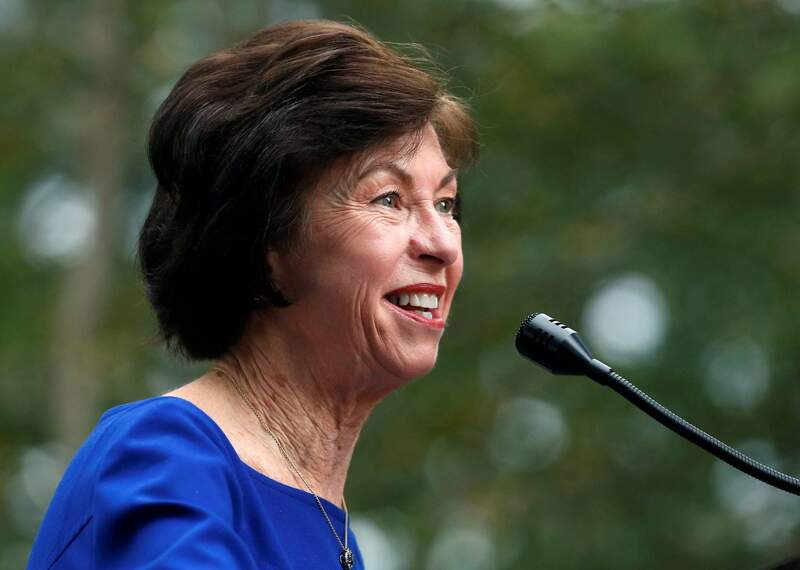 Mary Alice Welty White, a niece of the late author Eudora Welty and former director of the Eudora Welty House, speaks during the ceremony unveiling the inaugural Mississippi Writers Trail marker outside Welty’s house in Jackson, Miss. 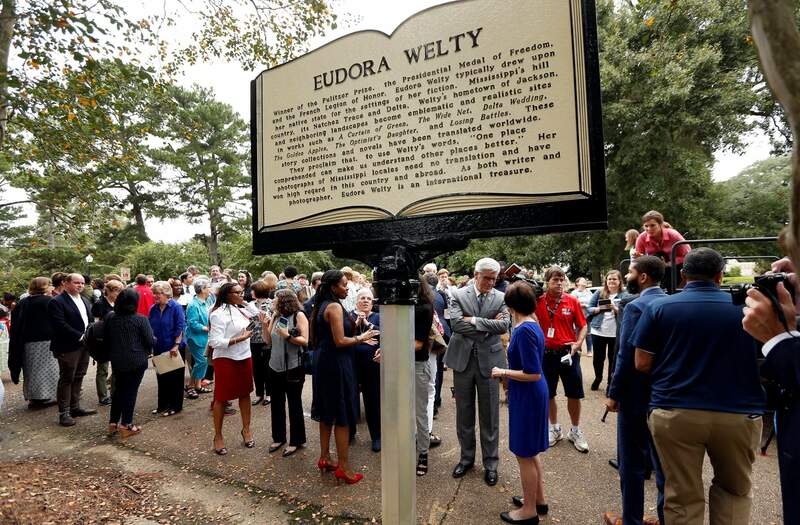 A crowd gathers behind the inaugural Mississippi Writers Trail marker honoring author Eudora Welty in Jackson, Miss., Monday, Sept. 10, 2018. The celebrated writer was the winner of the Pulitzer Prize, The Presidential Medal of Freedom and the French Legion of Honor. Welty typically drew upon her native state for the settings of her fiction and photography. Jon Parrish Peede, chairman of the National Endowment for the Humanities, second from left, joins Gov. 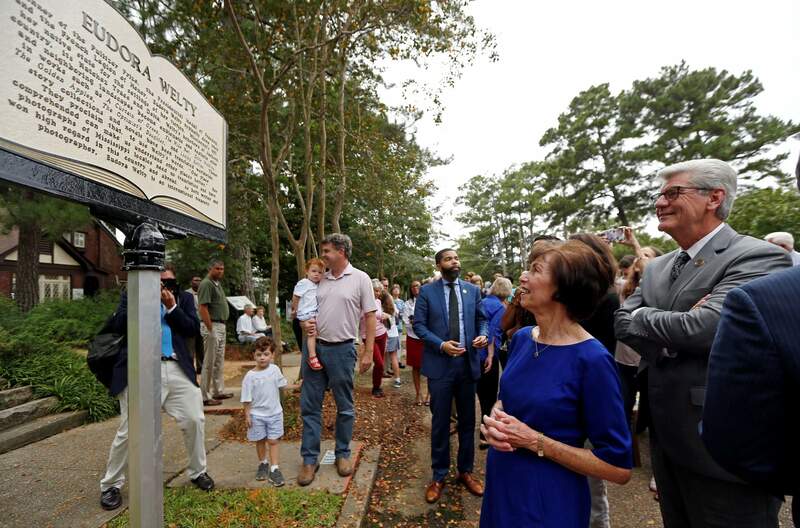 Phil Bryant, left, and members of celebrated writer Eudora Welty’s family in unveiling the inaugural Mississippi Writers Trail marker, outside Welty’s house in Jackson, Miss. 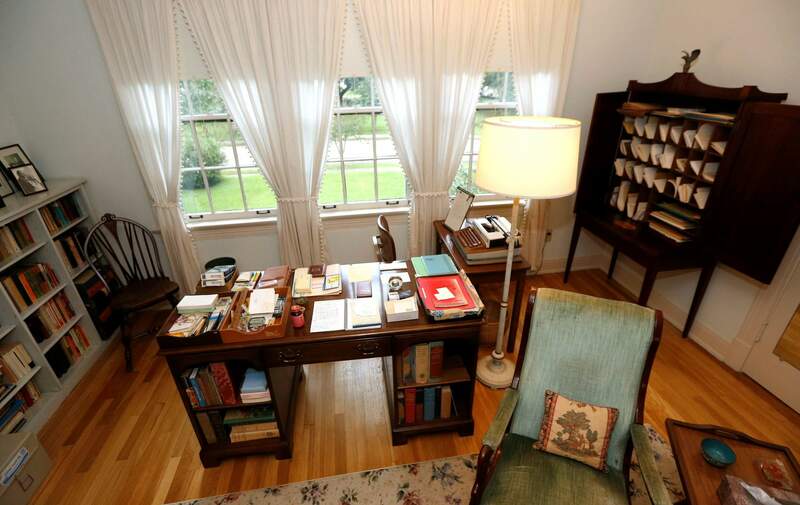 Although she preferred manual typewriters, the late celebrated author Eudora Welty, eventually used an electric typewriter, as evidenced by one on her desk in her bedroom office in Jackson, Miss. The inaugural Mississippi Writers Trail marker was unveiled outside Welty’s house in Jackson, Miss. JACKSON, Miss. – Mississippi has markers noting a blues trail, a country music trail, a civil rights trail and even an Indian mound trail. Gov. 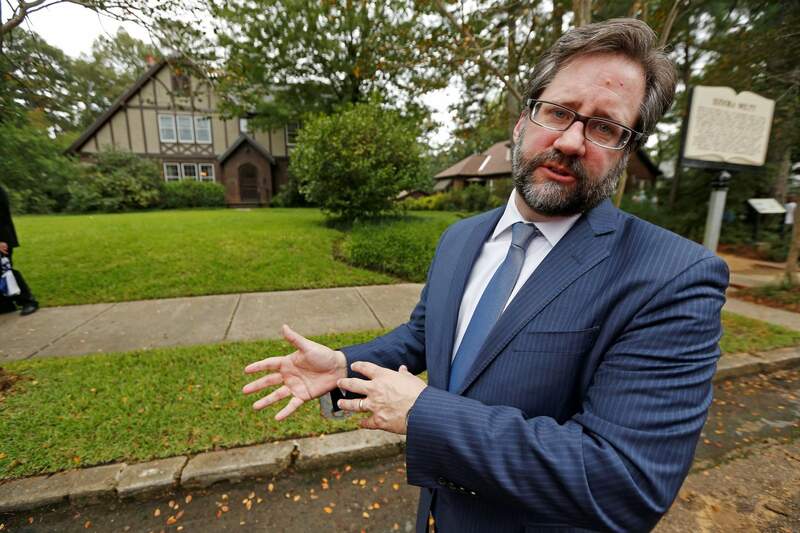 Phil Bryant and National Endowment for the Humanities Chairman Jon Parrish Peede dedicated the first marker Monday at Welty’s home in Jackson. Some of Welty’s relatives also took part in the ceremony. 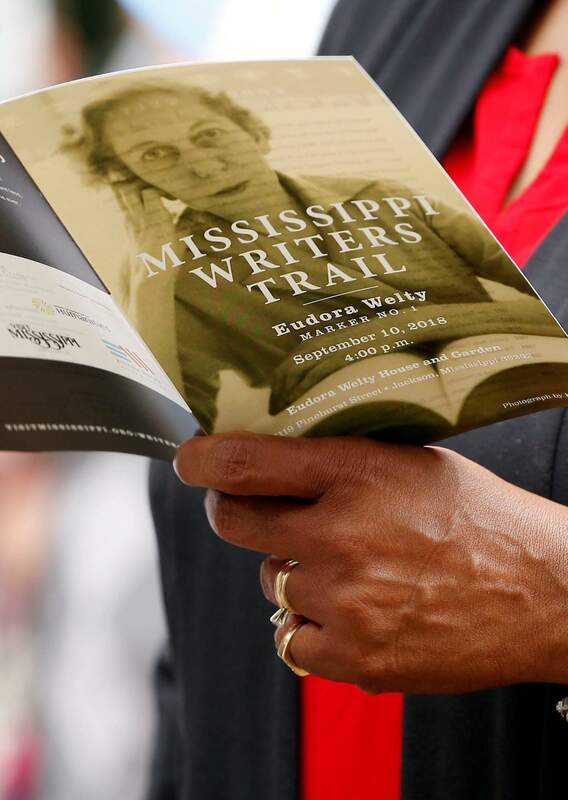 An audience member holds program with a photograph of the late author Eudora Welty, during the ceremony unveiling the inaugural Mississippi Writers Trail marker honoring her, outside Welty’s house in Jackson, Miss. 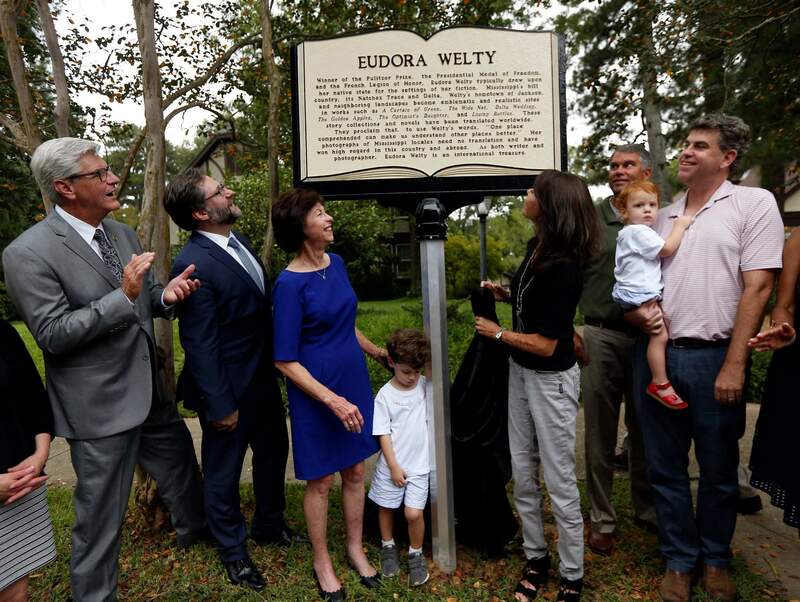 Jon Parrish Peede, chairman of the National Endowment for the Humanities, speaks about the importance of recognizing influential writers such as Eudora Welty, after the inaugural Mississippi Writers Trail marker is unveiled outside Welty’s house in Jackson, Miss., Monday, Sept. 10, 2018. Peede, a Mississippi native, joined Gov. Phil Bryant and Welty family members in the unveiling. Peede, a native of Brandon, Mississippi, recalled his involvement with the Eudora Welty House as a student and being proud of the endowment’s support for the house. Peede spoke about the importance of honoring the literary greats.